"A Wedding in Provence" is as delicious, sensuous and addictive as the meals, landscapes, sexual romps and wild rides of all sorts that Sussman so vividly describes." USA Today chooses A Wedding in Provence as one of its 10 Hot Summer Reads! "Just the ticket for sultry summer reading." 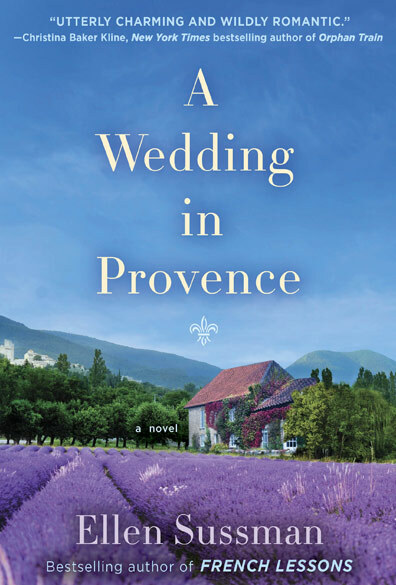 "Ellen Sussman's 'Wedding in Provence': The setting is the star"
"Women's fiction fans will enjoy Sussman's knowing exploration of mother/daughter relationships and the bond between sisters. The vivid description of Provence will whisk the reader away to the Mediterranean tout suite." "Olivia and Brody will tie the knot amid the splendors of the Côte d’Azur and all the tensions and drama that weddings inspire"
—Time Magazine Pick for summer reading! "Sussman once again expertly tells the story of one family growing up and moving on. With well-drawn characters, beautiful scenery, and challenging emotional terrain, Sussman’s latest is a satisfying exploration of family and the enduring power of love." "...a lighthearted tale of love, trust, secrets and family... Told with intimate authority and against the backdrop of southern France, Sussman brings the countryside to life with her rich narrative." A Good Housekeeping Choice for Best Summer Reads! with plenty of insight about love, loss and intimacy." "A Wedding in Provence is a rich novel set against the beautiful French country-side. The depth of relationships and histories of the characters, individually and together, make this novel both reflective and hopeful. A great read about what it means to truly stick together through thick and thin." "This is a stirring story about relationships, love and family. It will get the reader thinking as they watch a family who must confront the truth about each relationship around them."